Irresistible IR8919 silver cape dress. 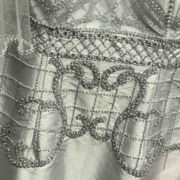 (ONLY SILVER LEFT SIZE 16) The perfect dress to keep you cool, covered but not restricted as Mother of the Bride or Groom. This dress has the most beautiful detailing on the bust and waist and has a charming vintage classic quality with a little quirky edge. The edge is of course is that little cape/shawl that acts as your sleeves giving a very feminine and soft appeal. The dress underneath is well structured with fine adjustable straps for support and adorned with pearls and beads. Irresistible IR8919 silver cape dress. The perfect dress to keep you cool, covered but not restricted as Mother of the Bride or Groom. This dress has the most beautiful detailing on the bust and waist and has a charming vintage classic quality with a little quirky edge. The edge is of course is that little cape/shawl that acts as your sleeves giving a very feminine and soft appeal. The dress underneath is well structured with fine adjustable straps for support and adorned with pearls and beads. The design helps to build the confidence that, in turn, builds pride. The structured fabrics and flowing overlays and allow the wearer to relax knowing that, whether sitting or standing the dress will keep the secrets of the years modestly covered.